So, now you know two things about me. I write in my books and I can’t draw. 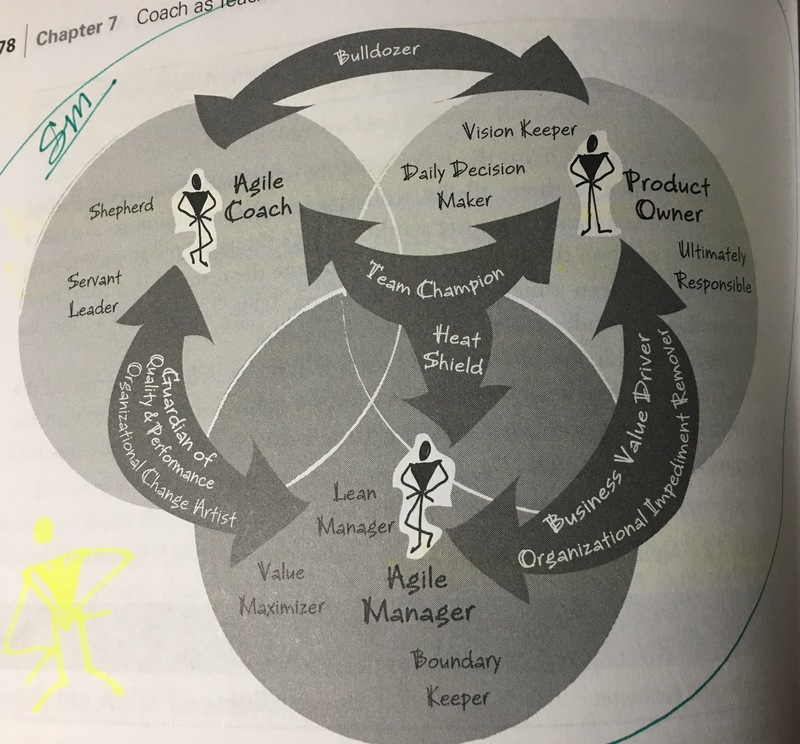 I snapped a shot of this image from the Coaching Agile Teams book – Chapter 7, (Lyssa Adkins) because it is an amazing way to portray how the role of the scrum master, product owner, and agile manager work together. Too often I see coaches running off managers and basically telling them that they no longer have a job. Managers are seen as the enemy of Agile. It doesn’t have to be that way. It shouldn’t be that way. We should be teaching managers what their new, even more powerful, role is! This picture really stirred me up because it put into writing questions I have often had explaining to the scrum master and agile manager. There are also pieces of this that validate things I’ve always instinctively known but didn’t have anything but my gut to tell me it was true. I love that the overlap in these roles is there by design. It’s not a place to struggle for control – it’s a place to partner for power! The scrum master intentionally shares the bulldozer of impediments function with the product owner because the person with the most influence is more effective depending on the actual impediment. The scrum master AND the manager are the guardian of quality and performance and partner also on organizational change. When I read this my first thought was, “There it is! I have a tool to help scrum masters understand that THEY are a guardian of quality and performance.” This means that the scrum master very clearly has a role in ensuring that the team is getting better at delivering quality code. It’s not only about ensuring they collaborate and sing Kumbaya — if they aren’t improving on delivery of quality code and satisfying their customer’s needs it really doesn’t matter that they are collaborating and enjoying one another’s company. The purpose of adopting scrum is because companies want to deliver. We’ve done so much focus on the people side of the scrum master that along the way we have lost the part where we must deliver. Accountability. Responsibility. These are not dirty words. They are the signs of a maturing team. The manager is a value maximizer and a partner with the product owner in driving business value. We can’t tell managers to step back and be completely uninvolved with the team. They are a partner to help ensure that organizational impediments aren’t hindering the teams and to ensure that the team is delivering business value. There it is again … delivering. I’m not sure why everyone has forgotten the importance of delivery. We (the industry / agile coaches) have been so focused on creating self organization that we have stepped to the other edge to a place where responsibility and accountability are foreign to agile teams. They believe they should be left alone to do whatever they want and no one can tell them anything because managers aren’t supposed to be managers. How interesting how this anti-pattern has developed over the past 15 years. Ken and Jeff must be a bit frustrated with “agile coaches” and the damage that has come from those who really don’t now what they are doing. The last thing on this that was so powerful to me was that triple responsibility of being a champion for the team’s success and being a heat shield keeping things that distract them from DELIVERING from creating churn with the team. The reason this resonated with me so much is because I have seen scrum masters take the “protect the team” message as, “protect the team from managers” “protect the team from responsibility for their own actions or lack of action” “protect the team from the product owner.” The truth is that if we focused more on protecting the team from themselves and stopped colluding with them they would become high performing much sooner. Wow, there’s a lot of passion in here. It’s true. I’m passionate about this because I want to see people become successful. People who do not willingly take responsibility and stand accountable for their actions rarely experience true or lasting success. As a coach, I love my clients too much to leave them that way.